From left: Redondo Beach City Councilmember Christian Horvath, Hermosa Beach School Board member Margaret Bove-LaMonica, West Basin Water District Director Harold Williams, State Treasurer John Chiang, Torrance School Board member Terry Ragins, Al Muratsuchi, Torrance Mayor Pat Furey, Manhattan Beach City Councilmember Amy Thomas Howorth, State Sen. Ben Allen, Rep. Ted Lieu, Hermosa Beach Mayor Pro Tem Hany Fangary, Hermosa Beach City Councilmember Stacey Armato. 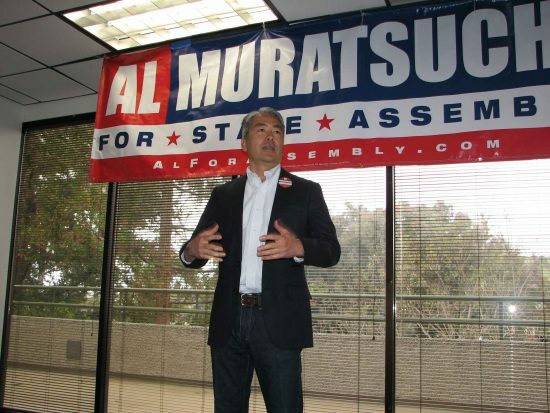 TORRANCE — With several elected officials in attendance, Al Muratsuchi officially kicked off his campaign for the 66th Assembly District on April 9 at a business park in Torrance. Muratsuchi, a Democrat and a state deputy attorney general, was elected to the Assembly in 2012 and served one term before losing to Republican David Hadley in the 2014 election. The district, whose voter registration is about 40 percent Democratic and 33 percent Republican, includes Gardena, Harbor City, Hermosa Beach, Lomita, Manhattan Beach, Palos Verdes Estates, Rancho Palos Verdes, Redondo Beach, Rolling Hills, Rolling Hills Estates and Torrance. Among those speaking in support of Muratsuchi was Rep. Ted Lieu of the 33rd Congressional District, which stretches from Malibu to the Palos Verdes Peninsula. “One of the things we’re now working together on is an idea that Al had to shine a little light on the importance of the aerospace industry right here in the South Bay. We have in the State of California a lot of commissions. We have a Strawberry Commission, we have an Asparagus Commission … Turns out that the aerospace industry, which actually has more revenues than the entire entertainment and agriculture industries combined, they don’t have a commission. They don’t have anyone fighting for them at the state level. Rep. Ted Lieu spoke at the campaign kickoff. 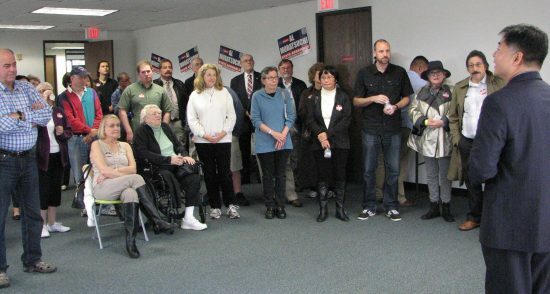 Muratsuchi thanked Richard and Melanie Lundquist for providing the space where the kickoff was held, which will also serve as campaign headquarters until the primary. He also thanked his wife Hiroko, whom he called “the most important person in the room,” for her support. 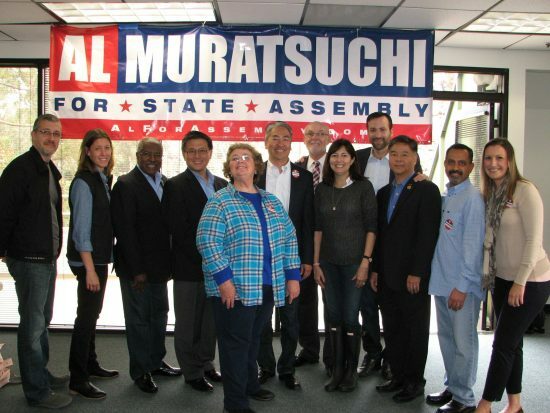 Muratsuchi’s campaign manager is Marc Sussman, who managed Lieu’s congressional campaign in 2014 and enabled him to beat 18 other candidates in the primary. Lieu said Sussman did a “phenomenal” job. Lawndale Mayor Robert Pullen Miles, Redondo Beach Councilmember Christian Horvath, Manhattan Beach Councilmember Amy Thomas Howorth, Rolling Hills Estates Councilmember Judy Mitchell, West Basin Municipal Water District Director Harold Williams, Palos Verdes Library District Board member Kay Cooperman Jue.